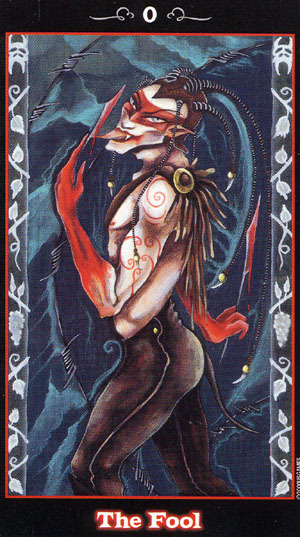 The Vampire Tarot features artwork that is dark and romantic. Artist Natalie Hertz used colors that are deep and vivid. She implemented metallic inks, fabric and unusual paper into her paintings. Her vampire characters are frightening and bizarre with elven ears, slanted eyes, and long narrow angular faces. Surrounding all of the cards is a border that is reminiscent of rod iron fencing, perhaps inspired by something from a cemetery. In the border are realities of death, as displayed in skulls, and the promise of life represented by blooming vines and bunches of grapes. The backs of the cards are deep red with black borders and black spirals, symbolizing the blood hunt during the cloak of night. Ask a question or in the box below.